Android App That Generates Blackberry IMEI Number. A very brilliant development from ™codeberg I must say. 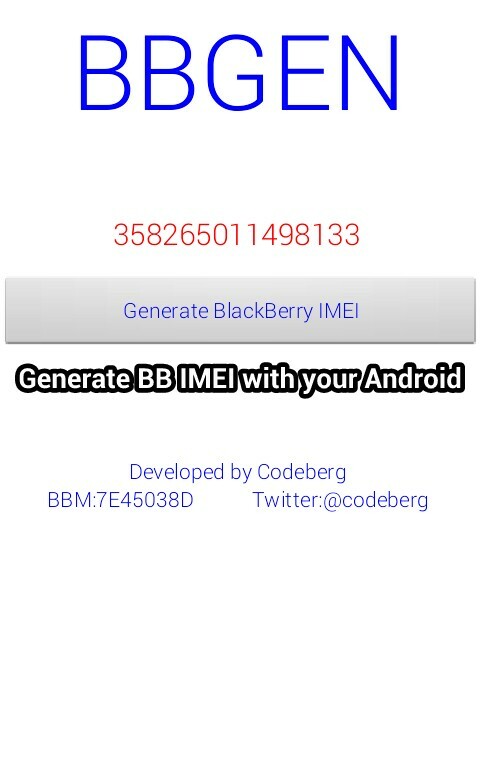 This Android app that generates BlackBerry IMEI number have been the dream of so many Android users who have no laptop but want to generate an IMEI number in other to use and enjoy Glo Bis. Well, if you're one of those who'd like to opt in for Glo BlackBerry internet service (BIS) but have no laptop to generate an IMEI, I'd say.. This post is dedicated to you. You can now generate your Blackberry IMEI number directly from your Android device. You can generate as many as you want. To download the the app just click the link below. The big question now is, why opt in for glo Bis when you can subscribe and download unlimitedly with mtn Bis.